Karan Johar’s Kalank is one of the most anticipated big-budget multi starrer period drama of the year. The wait now nears an end, as the movie is scheduled to release this coming Wednesday. Apart from an ensemble cast of Alia Bhatt, Varun Dhawan, Sonakshi Sinha, Aditya Roy Kapur, Madhuri Dixit and Sanjay Dutt, what has attracted huge applause is the film’s soulful music. 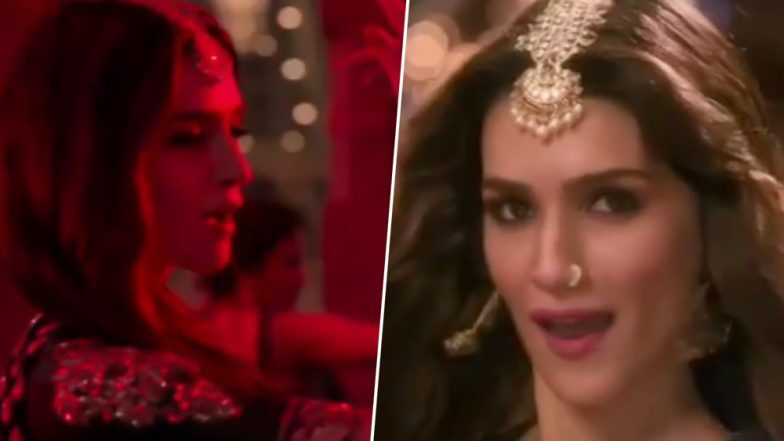 After the dance numbers – Alia’s "Ghar More Pardesiya", Varun’s "First Class" and Madhuri’s "Tabaah Ho Gaye" – now Kriti Sanon is all set to tease us with her charismatic dance performance. Did Kalank Star Varun Dhawan Just Reveal The Reality of Award Show Winners? Kriti’s dance track “Aira Gaira” will be launched tomorrow. A glimpse of the song was released today and the gorgeous diva has got our undivided attention. While Kriti is slaying the fans with her ‘latkas’, ‘jhatkaas’ and scintillating hot looks, our boys - Aditya and Varun – are not far behind. Karan Johar took to his social media handle to share the teaser video. He wrote, “With @kritisanon & the boys, tomorrow will be studded with double the stars! #AiraGaira out tomorrow!! #5DaysToKalank #Kalank @duttsanjay @adityaroykapur@varundvn @aliaabhatt @aslisona@madhuridixitnene @abhivarman@karanjohar #SajidNadiadwala@apoorva1972 @foxstarhindi@dharmamovies@nadiadwalagrandson@zeemusiccompany” ‘Tabaah Ho Gaye’: Twitterati Are Falling Head Over Heels for Madhuri Dixit’s Impressive Dance Performance in Kalank. Kalank has been grabbing headlines ever since the project was announced. With such magnanimous star cast, we expect the movie to do wonders at the box-office. Helmed by Abhishek Verman, the movie is bankrolled by Dharma Productions. Kalank is slated to hit the theatres on April 17.